Roasted Walnut Oil, Pomegranate & Apple Vinaigrette - A recipe from Savor California, the online showcase for extraordinary gourmet foods and beverages from California. Whisk together the pomegranate juice, apple cider, vinegar and oil. Then add the honey and seasonings and whisk until mixture is incorporated. 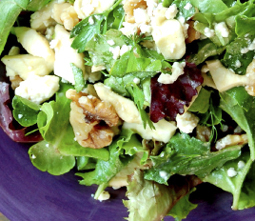 Serve over mixed field greens with bleu cheese, dried cranberries and candied walnuts. Yields just over 1 cup of vinaigrette.